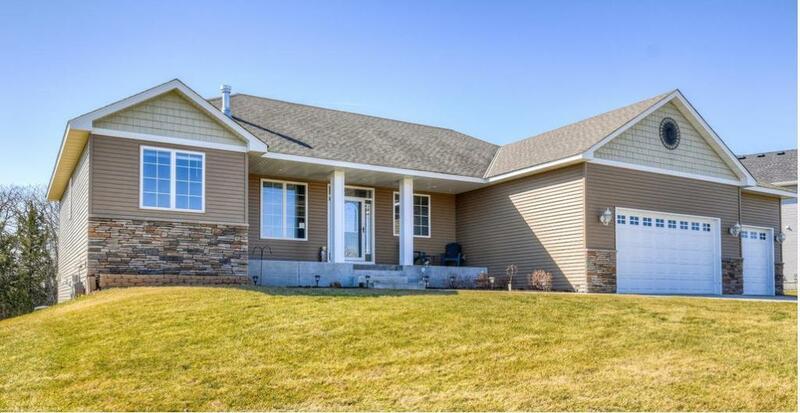 This warm and inviting rambler is full of natural sun light and has an open, flowing floor plan. You'll love the covered front porch, beautiful knotty alder cabinets throughout, large granite island, & stainless steel appliances. 3 bedrooms on main level with the potential for a 4th bedroom and bath in the lower level. Master suite includes walk-in closet, master bath with jetted tub and shower. Main floor laundry. The large lower level family room is great for entertaining and walks out to a beautiful 10' x 40' stamped patio. The 12' x 16' maintenance free deck is a great place for summer bbq's! You will enjoy deeded access to Eagle Lake, including a shared dock, firepit, and picnic table. Great location too...close to Northstar commuter rail and Highway 10. 1 year HMS home warranty included in sale.